Dissolved air flotation (DAF) systems from Baldwin Industrial Systems are skid mounted packaged units available in both rectangular and circular models. The DAF units are controlled by an on-skid control panel pre-cabled to on-skid equipment minimising on-site installation time and cost. All on-skid plumbing is factory fitted. Each DAF system is run in the Baldwin factory, providing assurance to the customer that the unit will arrive at site ready for operation. Dissolved air flotation is a liquid/solid separation process in which microscopic air bubbles become attached to solid particles suspended in liquid, causing the solid particles to float. In a DAF system air is dissolved into liquid under pressure, with the dissolved air remaining in solution in the form of microscopic air bubbles. The bubbles are mixed with wastewater, and in the process become attached to the solids in the waste stream causing the air solids agglomerate to float to the liquid surface where a solids or float blanket is formed. Surface skimmers then remove the float blanket. Baldwin DAF systems are available with flow rates up to 100,000 litres per hour. Construction is all stainless steel, with customer choice of plumbing in stainless steel (recommended) or pressure PVC. Utilising an air adsorption chamber with compressed air ensures maximum air dissolving efficiency, resulting in the smallest bubble size for superior contaminant separation performance. Baldwin DAF systems find application in food processing plants, mine site wash bays, oily water treatment plants and garment manufacturing factories. 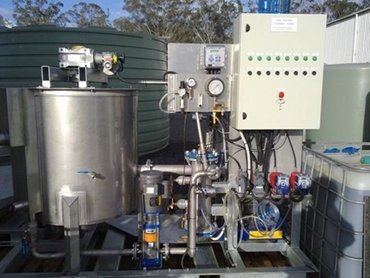 Some of the benefits of the Baldwin dissolved air flotation systems include an air dissolving system that provides air dissolving efficiency of approximately 90%; an air release system designed to maximise (greater than 90%) the conversion of air into bubbles appropriately sized for flotation; and an air/solids/polymer mixing chamber that provides intimate mixing for the air bubbles, solids and polymer, allowing for optimum air/solids bond formation. Coalescing plate separators; Preparation tank skid – coagulation and/or pH adjustment; Flocculation tubes – stainless steel or pressure PVC; Flocculation tanks; Pre-treatment pH control systems; Dosing packages – polymer, coagulant; Air compressors – if no factory air available; DAF feed and filtrate pumps; Sludge pump; Post-treatment pH control systems; Post-treatment filtration system; Post-treatment monitoring equipment – conductivity, suspended solids, oil and grease.